Arizona Secretary of State Michele Reagan stopped in for a visit to the Maricopa Public Library to see a demonstration of the Oculus Rift Virtual Reality Headset Wednesday afternoon. 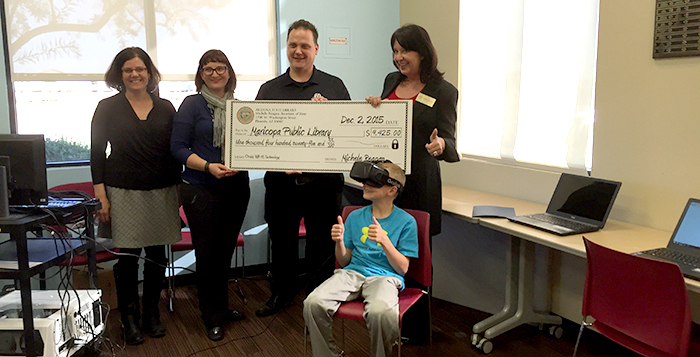 The library was awarded $9,425 from the Institute of Museum and Library Services to purchase the virtual reality equipment. 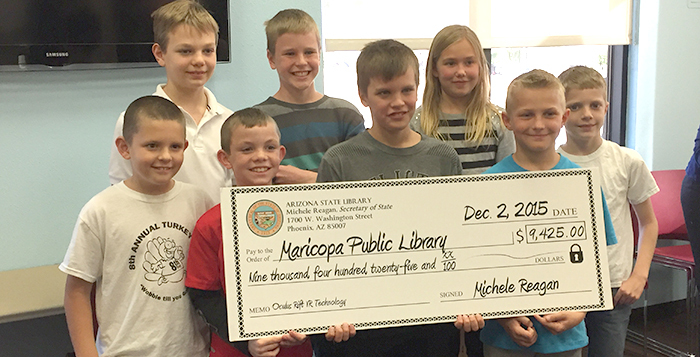 Reagan brought an oversized check with her to present to the library’s staff, and she stuck around to see members of the library’s S.M.A.R.T. Kids program test the Oculus system. According to a statement released by Maricopa Assistant City Manager Jennifer Brown, the Oculus Rift is the latest advancement in virtual reality technology. Though it is still in development, and gaming is its primary, educational and business applications are currently being explored. Reagan chose not to test the equipment for herself, but the line of children waiting to have a turn on the system shows the money will be immediately put to use.